Gmail IMAP access is now enabled and available for free for all Gmail users. IMAP access ensures that Gmail users who access Gmail inbox via multiple email clients on different device platforms such as Outlook, Outlook Express, iPhone, Blackberry, Thunderbird, Windows Mobile and etc from many locations to always have synchronized version of mails. After configuring email client to access and read Gmail with IMAP protocol, there is problem that emails cannot be deleted, or email still appearing in “All Mail” folder or Gmail web interface mailbox even though you have deleted the emails from Inbox of IMAP folder. The deleted e-mail at IMAP client not removed from Gmail inbox storage and still been kept is caused by the unique feature of Gmail, which pioneered label technology to categorize mails. In IMAP-enabled Gmail, each IMAP folder is actually a label on the email message, and is not part of actual location of the message. Thus deleting an email message from inbox is actually just removing the inbox label which identifying the message as being in the inbox from the mail message in Gmail engine, and deleting a mail message from a folder means remove custom label on email as when view from Gmail web interface. Thus, after deleting a message from inbox or one of the custom folders in IMAP client, the message will still appear in [Gmail]/All Mail folder or “All Mail” option from Gmail web view. “All Mail” shows all of e-mail messages, whether or not they have labels attached to them. In order to delete a email message from all folders in Gmail, or move the mail message to trash by using IMAP email client, users will have to physically move the message to the [Gmail]/Trash folder in the IMAP folders shown in the client. 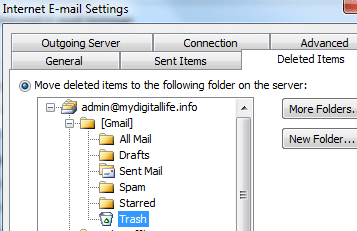 In Outlook 2010 and newer email clients, you can set Outlook to automatically move the deleted items to [Gmail]/Trash folder on the server. To do so, go to the “Account Settings” of the Gmail account, and change its account settings. At “More Settings”, go to “Deleted Items” tab, and select “Move deleted items to the following server on the server”, and select the “[Gmail]/Trash” folder in the tree list. An email message in Outlook can appear in many folders (applied with many labels). Typically, once you delete the email and move it to Trash, the email should be removed from other folders by Gmail too. Perform a sync or Send/Receive All Folders (for Outlook) so that mail client can synchronize the change that takes place on Gmail cloud after deletion. If for some reason Gmail and mail client does not automatically remove to Trash a delete email from all folders (labels), and the supposedly deleted emails on folders other than Trash folder, then manual deletion from each and every folders is requires. This including from [Gmail]/All Mail folder which archived all mails. Once the e-mails are moved to Trash folder, it will be automatically purged by Google server process after 30 days. You can also configure your mail client to process purge permanently items mark as trashed or deleted in the original folder automatically from the server. Note that also if you delete any email message from [Gmail]/Spam or [Gmail]/Trash, it will be deleted permanently, locally and on Gmail server.